This picture is beautiful. It makes me realise that we are all brothers and sisters in the eyes of the Lord. Let’s all be nice to one another. Great idea, Kauf Buch. Count me in, if I am allowed in without believing in “the Lord”. THIS POST WAS NOT WRITTEN BY ME. Just kidding… of course, it was written by me. NO IT WASN’T!!! DELETE IT! OK… sorry for that. Don’t delete it. It was me. I’LL KILL YOU LIBTARD B**CH!!! LEFTIST ****!!! If Kauf Buch were my brother I would kill him to restore the family honor in the eye of society and God. In Bernizwailia we don’t have apple, like Latvians, we have no potato either, we have Spot. Not even ketchup for Spot. Very sad. Only Jehovah’s Witnesses believe that dinosaurs lived at the same time as human beings. Are you one. Are you serious? They actually believe that? @Just me: Yes, they do. 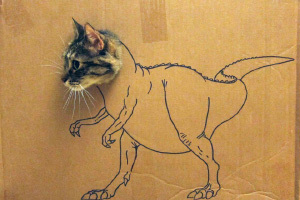 The reason the dinos aren’t with us anymore is because they couldn’t fit on Noah’s Ark. The dinos, who were created the same time Adam and Eve were, died in the flood. You know, the flood of Noah and the ark and so on? This is why so many fossils are found, even of very fragile life forms such as jellyfish that would otherwise decompose within a few minutes to hours, they were all suddenly buried under tons of sediment kicked up by the global flood. There are even “side by side” footprints of dinos and humans but I know you guys who don’t want to know the truth will keep on ignoring science. Science like the massive global climate change aka flood that placed all those tropical plant and animal fossils at the polar regions, those polar regions that today are covered with miles of ice and snow. Perhaps the dinos and cave men caused global warming with their flinstone cars and caused climate change back then? The bible is true, messiah loves you, and eternal life is a free gift, how sad some will perish because they rejected a free gift. Great explanation, Josh! Now, where do leprechauns and Vishnu fit into that? Don’t leave us hanging! If Adam and Eve were the first people, – why do they have belly buttons??? That and: If the flood covered the entire earth, where did the water recede to? @Russel Sprout God is an alien. He made them in tubes with artificial placentae. 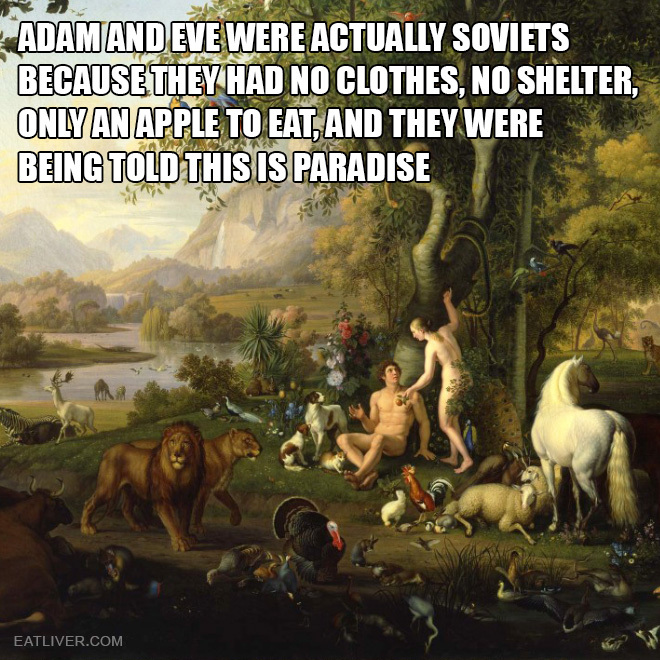 Eve was made out of Adams ribb. Means she was cloned and genetically altered after he had all that trouble with Lilith. @Salzigtal It ran off the earth saucer. What else? Thanks Dat. Or, if it’s really turtles all the way down, it’s cascading to the next lowest one as we type. Yes. There is always a more lower level. But ask Kauf Buch about that. He comes from the lowest level there is. Only an apple to eat? Phfffbbbttt. Is the author blind? They’re surrounded by food… turkey, beef, veal, chicken and so on. Beautiful scenery, naked woman, food everywhere… it IS paradise. And now, they have influential positions in the Trump administration! The leftist’s inferior candidate Hillary lost the election. True, and the Snake became president.